In his Gospel, John emphasizes the reality that Jesus handed over his life for us. As Jesus says, “The Father loves me for this: that I lay down my life to take it up again. No one takes it from me; I lay it down freely” (John 10:17-18). During Jesus’ life some tried to kill him, but they were unable because his hour had not yet come. When Jesus was an infant, King Herod looked for him in order to kill him. In Nazareth his neighbors intended to hurl him from a cliff, yet he walked through their midst. At various times, as we read in the Gospel today, the religious leaders planned to arrest and kill him, but they were unable to. John teaches us very clearly that Jesus really desired to accomplish the Father’s will and to give his life for us. His sacrifice on the cross is an act of profound love. 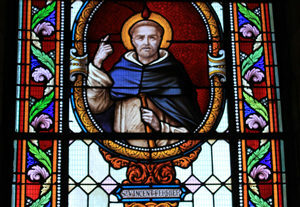 Today we celebrate the memorial of St. Vincent Ferrer, a priest and a Dominican, who lived from 1350 to 1419. He was not a martyr, but he gave his life for the Gospel. He worked tirelessly for the unity of the Church during a time of many divisions. Vincent, following Jesus’ example, served the Church faithfully every day. Our goal in Lent is to follow Jesus more faithfully in our own vocation. As we continue this day, let us ask Jesus, through the intercession of St. Vincent, for the generosity and love we need to give our lives for him and the Gospel. En su Evangelio, San Juan hace hincapié en el hecho de que Jesús entregó su vida por nosotros. Tal y como Jesús dice al pueblo: “Por eso me ama el Padre: porque entrego mi vida para volver a recibirla. Nadie me la arrebata; la entrego libremente” (Juan 10:17-18). Durante la vida de Jesús, algunos intentaron matarlo, pero no fueron capaces porque su hora aún no había llegado. Cuando Jesús era un niño, el Rey Herodes lo buscó sin éxito para matarlo. En Nazaret, sus vecinos intentaron arrojarlo desde un precipicio, pero él caminó a través de ellos. En varias ocasiones, como leemos hoy en el Evangelio, los líderes religiosos planearon arrestarlo y matarlo, pero fueron incapaces de hacerlo. Juan nos enseña muy claramente que Jesús realmente deseaba cumplir la voluntad del Padre y dar su vida por nosotros. Su sacrificio en la cruz es un acto de profundo amor. Hoy celebramos la fiesta de San Vicente Ferrer, un sacerdote dominicano que vivió entre 1369 y 1419. No fue un mártir pero entregó su vida al Evangelio. Trabajó incesantemente por la unidad de la Iglesia durante una época de grandes divisiones. Vicente, siguiendo el ejemplo de Jesús, sirvió a la Iglesia fielmente cada día. Nuestro objetivo en la Cuaresma es seguir a Jesús más fielmente en nuestra vocación. Al continuar este día, pidamos a Jesús, a través de la intercesión de San Vicente, la generosidad y el amor que necesitamos para entregar nuestras vidas por él y el Evangelio.